Vivo Y17 is all set to be launched next week and here’s all about this smartphone. Earlier this week, we came across claims that Vivo is working on a new smartphone allegedly dubbed Y17. It was speculated that this smartphone will be launched in India next week around the Rs. 10,000 price point. Now, further details regarding this smartphone have emerged online. 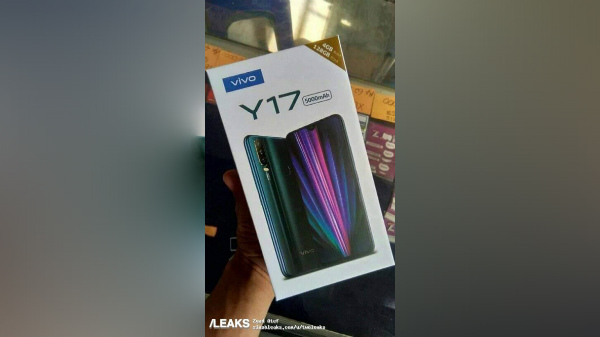 A fresh leak that has surfaced on Slashleaks as leaked an alleged image of the retail box of the upcoming Vivo smartphone. The design of the device seen on the retail box is similar to that of the device on the leaked poster that emerged lately. 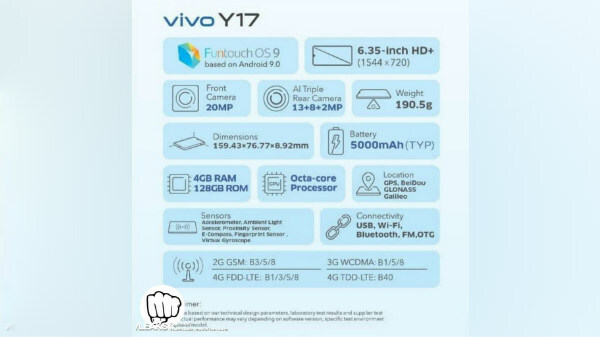 Besides this, a poster leaked by an Instagram account GadgetFight.id reveals the complete specifications of the smartphone. When it comes to the leaked specifications of this smartphone, it is claimed to arrive with a 6.35-inch HD+ display with a resolution of 1544 x 720 pixels and a waterdrop notch. Under its hood, this Vivo smartphone all set to be launched next week in the country might arrive with an octa-core processor teamed up with 4GB RAM and 128GB of default memory space. We can expect it to feature a microSD card supporting expandable storage space as well. For imaging, this Vivo Y17 is believed to arrive triple cameras at its rear. The camera specifications are said to include a 13MP primary sensor, an 8MP secondary sensor and a 2MP third sensor. Up front, it is expected to feature a 20MP selfie camera. Connectivity wise, this device is claimed to arrive with GPS, Bluetooth, Wi-Fi, FM, BeiDou and a USB Type-C port. A capacious 5000mAh battery is likely to power the device from within. The leaked retail box image and the leaked poster both suggest the presence of vertically positioned triple cameras, a gradient rear panel design and a rear-mounted fingerprint sensor. The device is believed to arrive with Android 9 Pie topped with FunTouchOS 9.